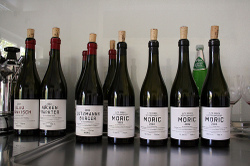 Thanks for the shout out about the Moric. Stephan also wrote a rather epic piece about Roland, his philosophies, the history of his vines, his vinification process, etc. etc. Folks can find it in our WinemongerTalk section. First I saw your name on something in the Deseret News about food, and now I see it in Salt Lake City magazine, so I'm wondering, do you live in Salt Lake? If so, we must have dinner sometime, or maybe even try to organize the local food/wine bloggers a bit. I know there are a couple of others here. I've met Vanessa of She Craves, who isn't blogging much, but still writes about food for Salt Lake City magazine. Anyway, very curious here, and would love to meet you if you're in Utah. D'accord with the quality of Roland's wines, even the basic cuvée is serious and makes fun. Try to find the Neckenmarkter 2004. One correction: Roland did not buy a winery in Mittelburgenland, he just buys the grapes from contracted vintners. His vinery is located more in the north near Eisenstadt. The 2003's are all but sold out (I think we have 1 bottle of the Alte Reben left, and just a few of the basic Neckenmarkter). The 2004's are on the ocean and will be available in about 8 weeks, but quantities are VERY small. To give you an idea- the largest wine retailer in Austria only got 34 bottles of the Alte Reben. We got a few more...but not many!